Our 2016 programme brings together an excellent line-up of more than 65 high-level international speakers to stimulate thought and debate. We have sourced experts from many different sectors to provide different perspectives and encourage knowledge transfer between industries and applications. Attendance will enable you to choose the right biometric technology for your needs and understand all the issues to consider when implementing the system. 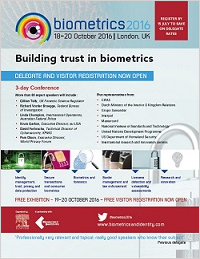 A new focus on the social implications of biometrics looks at this important topic- which crosses all sectors. It has taken us over a year to get this expert group of speakers together to discuss this sensitive subject in a public forum. You cannot miss out on being in the room to make your contribution.